As Motorcycle Safety Awareness Month draws to a close, we ask both motorcyclists and automobile drivers to take a moment to think safety this summer. 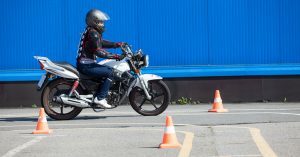 Motorcycling continues to grow in popularity in Massachusetts and around the country, and so do fatal crashes between cars and motorcycles. The National Highway Traffic Safety Administration (NHTSA) reports in 2008, motorcyclist fatalities increased for the 11th consecutive year. Some 5,290 motorcyclists lost their lives in fatal highway crashes. Almost 50 percent of all motorcyclists involved in fatal crashes collided with other motor vehicles. Over 90 percent of all fatal two-vehicle crashes involving a motorcycle and a passenger vehicle occurred on non-interstate roadways. About half of all fatal crashes between a motorcycle and a passenger vehicle occurred at intersections. Often the driver of the car or truck involved in the accident simply failed to observe the motorcyclist. Wear a helmet. NHTSA statistics show you have a 29 percent better chance of surviving a crash than without a helmet. If you’re concerned helmets interfere with your ability to see and hear on the road, read this NHTSA study. It found helmets caused no substantial impact: drivers wearing helmets had to turn their necks only slightly farther at times and there was no significant difference in hearing. Remember to turn off your flash signal if it’s not self-canceling. Make sure you’re experienced enough to ride with a passenger. It changes the way the bike handles and requires more skill. Take turns slower than you think is necessary. Remember a motorcycle has the same rights as any other vehicle on the road. Do not attempt to share a lane with a motorcyclists. Allow the motorcyclist a full lane width to maneuver safely to avoid motorcycle crashes. Remember to use your signals to change lanes or merge with traffic. Motorcyclists depend on those signals even more than other drivers. Check your vehicle’s blind spot! Motorcyclists are even easier to miss due to their small size. Don’t rely on a motorcycle’s flashing turn signal. They may not be self-canceling and riders sometimes forget to turn them off or can’t do so immediately due to road conditions. Wait to make sure the motorcyclist is really going to turn to avoid motorcycle collisions. Remember motorcyclists often change speed or adjust position within a lane suddenly in response to road and traffic conditions. Allow the motorcyclist extra room – at least three or four seconds. Tagged: "Boston personal injury lawyers", "motorcycle crashes" and "motorcycle safety tips"